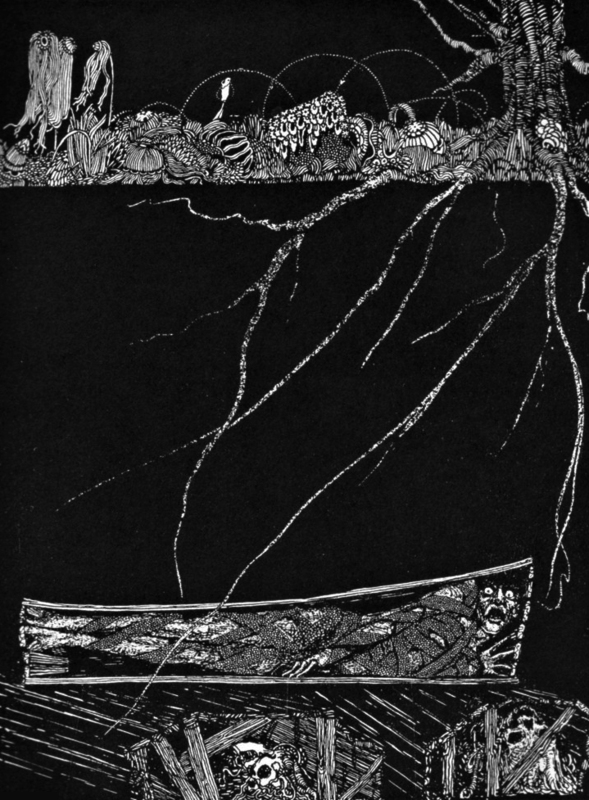 Illustration for Edgar Allan Poe’s story “The Premature Burial” by Harry Clarke (1889-1931), published in 1919. Taphephobia. Greek for “fear of the grave.” With science and medicine such as it was for hundreds of years, it was not uncommon for men and women — rich and poor, educated or not, famous (http://mentalfloss NULL.com/article/64180/10-famous-people-who-were-afraid-theyd-be-buried-alive), infamous, or otherwise —to be afraid of being entombed alive. On his deathbed, George Washington apparently told his secretary that “”I am just going. Have me decently buried; and do not let my body be put into the vault in less than three days after I am dead.” Spoiler: he did die, and was buried at Mount Vernon in 1799. He was not later found to have bloodied his fingers by scratching at his coffin or chewing the tips for basic sustenance. He did not become one of the undead (though undoubtedly, someone is right now working on a novel to that effect). 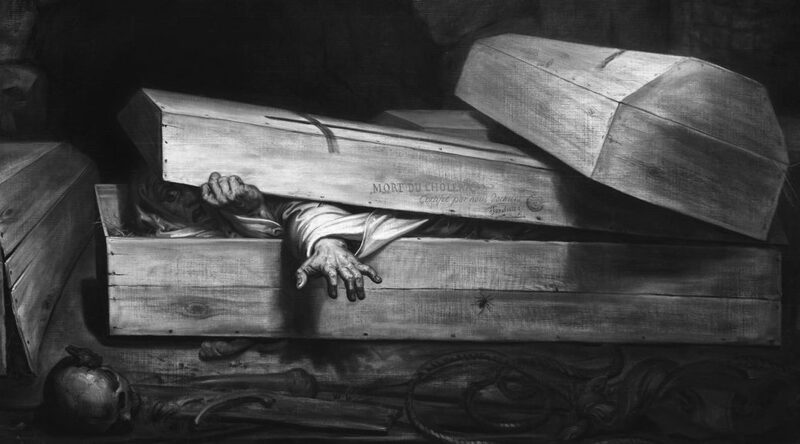 But he did have a very real fear that many shared in the 18th and 19th centuries: being buried alive. The earliest known written reference of a premature burial comes from Pliny the Elder in his Natural History of 77 AD. In a chapter entitled “Persons Who Have Come to Live Again After Being Laid Out for Burial,” Pliny recounts tales of people waking up after being declared dead. Fast forward to the 14th century, and there’s the story of philosopher John Duns Scotus, reportedly found outside his coffin with bloodied hands. Three hundred years later, and European rationalists would be stymied by a vampire craze — fueled by bloody bodies of exhumed corpses that were said to run amok at night and plague their families. But one need only Google for a few minutes to find modern cases of premature burial. 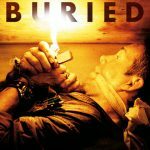 As recently as just a few short months ago, a Brazilian woman claims to have been buried alive (https://www NULL.independent NULL.co NULL.uk/news/world/americas/woman-buried-alive-coffin-brazil-11-days-rosangela-almeida-dos-santos-a8213646 NULL.html), spending 11 days trying to get out of her coffin. 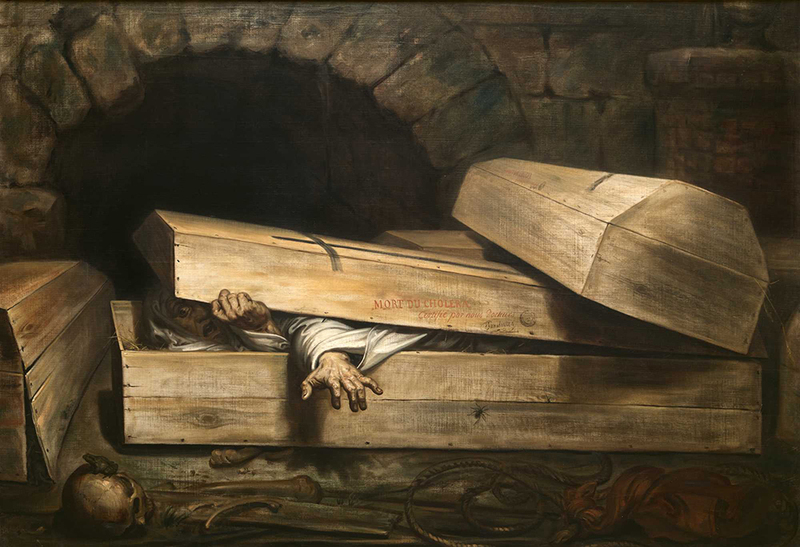 Curiously, though, the most widespread cultural obsession with being buried alive is found in the 18th and 19th centuries. 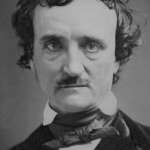 Most famously captured in Edgar Allen Poe’s The Premature Burial (https://www NULL.gutenberg NULL.org/files/2148/2148-h/2148-h NULL.htm#link2H_4_0015) (1844) — where (spoiler) the real fear comes from an overactive imagination or fevered dream — the panic and paranoia felt by the 18th and 19th century taphephobe can, in many ways, be blamed on a distrust of one’s doctor(s) to properly certify death, and an all-too-ready cadre of family, friends, and neighbors who were quick to get the body into the grave — mostly, for fear of spreading disease. It is the latter that may explain some of the vampire hysteria that began in eastern Europe and spread west as far as Austria and Germany in the 1700s. As early as the 1670s, doctors wrote treatises about ‘grave eating’ where bodies were exhumed and found to have eaten their own shrouds or feasted on their own fingers. Bubonic plague lasted until as late as 1750, and it is understandable that villages throughout Europe feared that dead bodies could spread disease. Folklore of the vampire from Eastern Europe coupled with writers spreading the tale of Arnold Paole (https://en NULL.wikipedia NULL.org/wiki/Arnold_Paole) in Germany in 1732 added fuel to the fire that undead bodies, rising from their graves, could spread a disease, too. Symptoms of tuberculosis, for example — light-sensitive eyes, pale skin, low body heat, coughing up blood — could easily be misconstrued as victimization by vampires. Many of those who passed from such a disease would have been buried in haste. As others fell victim, and a vampire suspected, exhumation seemed logical. Kill the vampire and prevent the spread of the disease. When the body — due to the natural bloating, bubbling of bodily fluids, and shrinkage of the skin we now know are associated with decomposition — was exhumed, it must have been a shock. To the superstitious, the undead were blamed. To the rational, there was suspicion of accidental premature burial. To some, both were a possibility. Physicians studying this so-called vampire epidemic of the eighteenth century wrote over a dozen articles in professional journals about the subject, along with numerous treatises. In some parts of Europe, there was widespread panic that vampirism would spread much like the plague. It was modern-day folklorist Paul Barber — in his seminal Vampires, Burial, and Death (https://www NULL.amazon NULL.com/Vampires-Burial-Death-Folklore-Reality/dp/0300048599) — who most effectively argued that the incidence of presumed vampirism or being burial alive has been overestimated, and that the normal effects of decomposition are mistaken for signs of life. And as the Enlightenment gave way to more scientific explanations of all things related to death, it was serious medical doctors, not priests or doctors of philosophy, who were looked to as authorities on death and disease. But did medical doctors sometimes get it wrong? Were certified deaths sometimes the result of a doctor not noticing a faint heartbeat or weakened breath? Unlikely. But as the superstitions of the eighteenth century gave way to the more scientific approaches to death of the nineteenth, it’s not without reason that people began to — and rightfully so — fear doctors. After all, it was quacks like Moore Russell Fletcher, M.D. 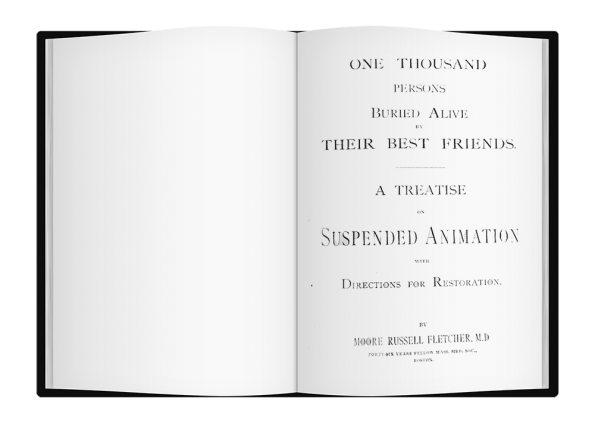 who published as late as 1884 his “One Thousand Persons Buried Alive by Their Best Friends”, a pamphlet placed inside the back of a textbook on common ailments and diagnoses: Our Home Doctor. Books like these contributed to the paranoia that being buried alive was a real possibility (really, “one thousand persons”!). Outbreaks of Cholera in the mid to late nineteenth century — such as that in and around 1854 when Antoine Wiertz painted his ‘L’Inhumation Precipitee’ (the work that appears in the feature section of this post) — did much to fuel the fire of ignorance and fear. Such fear led to the formation of some curious clubs — among them, The London Association for the Prevention of Premature Burial, founded by Dr. William Tebb of Manchester (who also wrote a book on the subject, available in its entirety, here (http://www NULL.gutenberg NULL.org/ebooks/50460?msg=welcome_stranger)). His 1896 treatise is definitely a far more credible examination of the possible causes of, and ways to avoid premature burial than Fletcher’s (again, one thousand persons??? ); at nearly 400 pages, Tebb’s book is quite comprehensive, leading one to believe that the phenomenon was quite prevalent and quite real as the nineteenth century came to a close. Of course, modern-day scholars say it wasn’t, but that doesn’t make the beliefs any less potent. Ardent beliefs certainly explain the prevalence of devices invented by enterprising men to combat premature burial at its source — from within the grave itself. 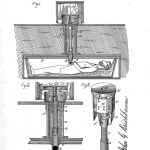 The first recorded of these, a safety coffin, was ordered by Duke Ferdinand of Brunswick in 1792. It was equipped with keys to open the coffin and, should there be one, the mausoleum door. There was even a window for light, and an air tube. In 1829, Johann Taberger created a bell system that had ropes attached to the body so any slight movement would alert night watchman in the cemetery. In 1868, Franz Vester revealed his “Burial Case” — a coffin which included a tube for a curious passerby to see the face of the corpse. 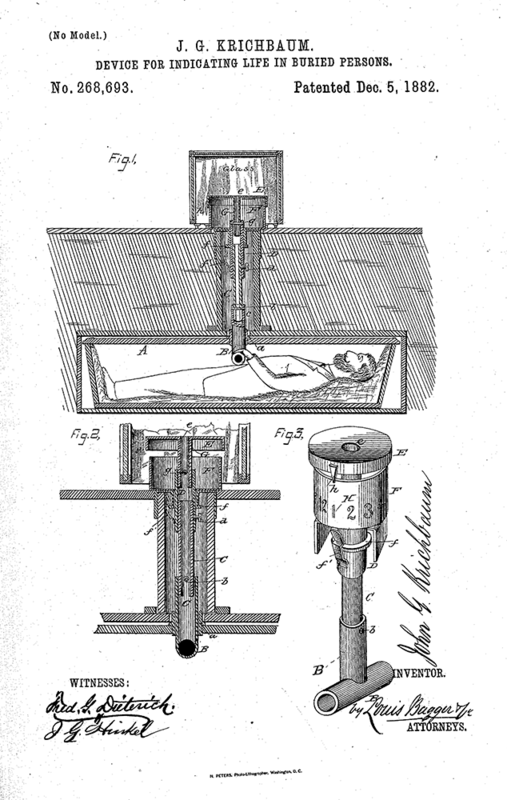 A nobleman, Count Michel de Karnice-Karnicki, patented a coffin in 1897. His coffin also detected movement, and would open a tube to supply air along with not only ringing bells but also raising a flag. Yet, despite the effort put in to making these devices, there’s no evidence that they ever actually saved anyone’s life. This is not to say that people were no prematurely buried. 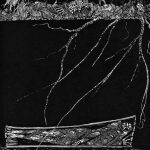 Many an article online (http://www NULL.dailymail NULL.co NULL.uk/news/article-2289355/Let-coffin-Im-alive-New-book-reveals-spine-chilling-true-stories-premature-burial NULL.html) documents case after case in the nineteenth AND twentieth centuries. 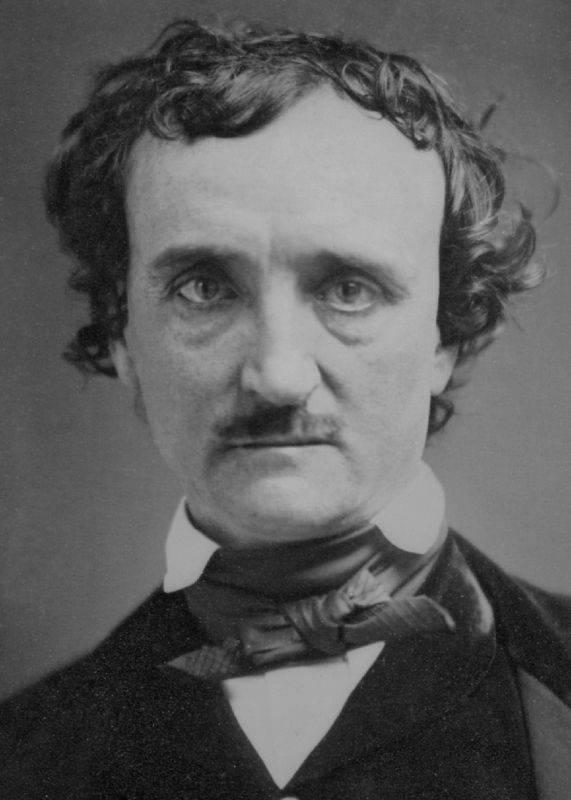 Authors and filmmakers a century after Poe wrote his seminal tale continue to fan the flames of this fear of being placed alive in one’s grave. 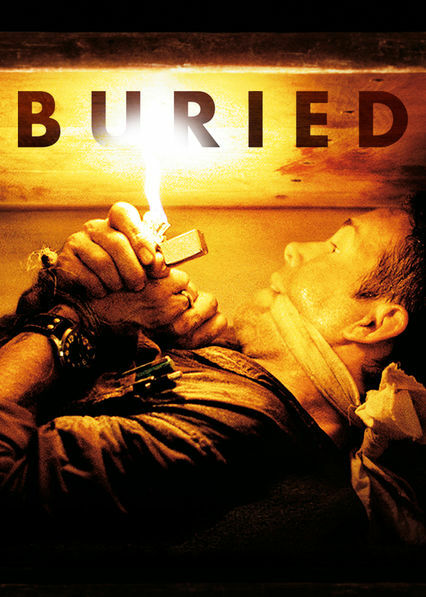 There was even a most effective (and well reviewed) modern thriller, 2010’s Buried (https://www NULL.rottentomatoes NULL.com/m/buried/), that made the fear of live burial very much a possibility in this, the twenty-first century. But is it all fiction? Actual or embellished, stories like the aforementioned Brazilian (https://www NULL.independent NULL.co NULL.uk/news/world/americas/woman-buried-alive-coffin-brazil-11-days-rosangela-almeida-dos-santos-a8213646 NULL.html) keep alive (pun intended) the notion that premature burial, even in the age of modern medicine, is still a possibility.